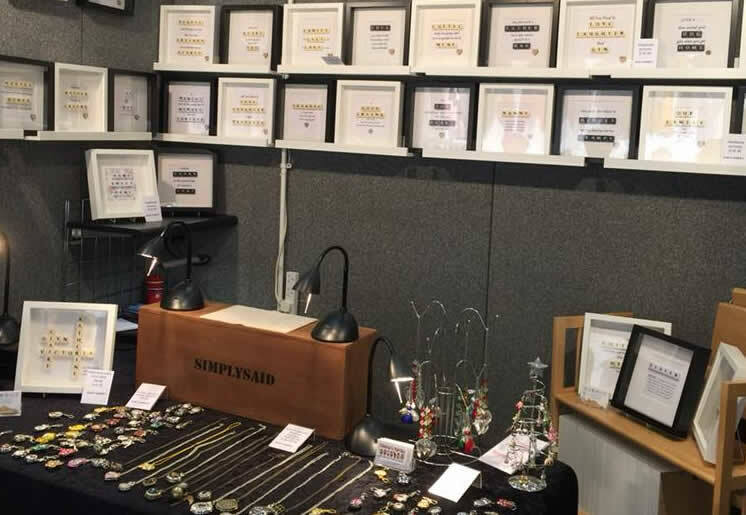 I started making jewellery in 2006 and soon my business began to grow, until it became a full time occupation, both teaching adults/children how to make jewellery and selling my items at various craft fairs/events/shops. In 2014 I was fortunate enough to start a new venture with a couple of friends and open a shop in Cheltenham (The Cotswold Galleria), we now (2019) support over 40 local artists all selling their handmade items through the shop, including my handmade jewellery. Following on in 2016, Simply Said was established by my daughters, they wanted extra funds whilst at University – initially 100 pictures were made before they returned back to Uni in September 2016, by the end of the October all pictures were sold! This is when I stepped in and decided to help them grow their business, making pictures and selling for them until they had the time and money to return home to make. Now 18 months on, both daughters have graduated and left home, finding jobs in London & Bath. As for Simply Said, it has grown immensely, I now have the pictures in 5 outlets around the country and am looking to supply more shops in the UK this coming year.